Imagine the government is telling you an epidemic outside your door is “only the flu” and not really serious. But you hear rumors that people are dying like flies. You’re asked to take in a few new orphans or to host out-of-town mourners or, God forbid, to nurse the sick. You’re terrified of exposing your own household to sickness. But your help is needed. Would you roll up your sleeves to help? Or lock the door and hide? People in our region and across the globe faced that ghastly choice 100 years ago during the Spanish flu pandemic of 1918. One century ago our ancestors experienced a tragedy so enormous that we’ve never fully reckoned with it. We’ve treated the 1918 flu pandemic like an embarrassing relative no one wants to talk about. And yet, “It was a plague so deadly that if a similar virus were to strike today, it would kill more people in a single year than heart disease, cancers, strokes, chronic pulmonary disease, AIDS and Alzheimer’s disease combined,” writes Gina Kolata in her book, “Flu.” She marvels that, as a microbiology major and history class student, the subject of the 1918 flu never came up during her college years. The virus sickened about 500 million people and killed 50 to 100 million, or 5 percent of the global population. This included at least 670,000 U.S. citizens. That’s more Americans than were killed in battle in World War I, World War II, the Korean War and Vietnam War combined, notes Kolata. The world’s worst pandemic exploded at the end of World War I. The war had already weakened human health via hunger, stress, poor sanitation and exposure to extreme cold. The Great War didn’t cause this freakishly virulent strain of influenza to develop, but it certainly hastened its spread, as more people moved around the globe than ever before, living and breathing in crowded ships, trains, barracks, tents, trenches and hospitals. The war also bred chaos and censorship. The true number of flu dead is impossible to pinpoint because countries like populous India, which was especially hard hit, kept no records. Other countries, including ours, downplayed losses to fool enemies. In the U.S., about 20 percent of those who got the 1918 flu died, compared to 1 percent in more typical flu epidemics. This is only an average. In some cases, entire communities were wiped out, especially among Eskimos and Native Americans. Rockford was hit especially hard because of nearby Camp Grant, one of 16 U.S. National Army training camps built in 1917 to produce soldiers as quickly as possible. It’s estimated the flu killed at least 2,300 people at Camp Grant and several hundreds more throughout Winnebago County, within five weeks. (That’s about the same number of souls who perished at the World Trade Center on Sept. 11, 2001.) Victims died so quickly that recordkeeping became a blur. Along with chaos, censorship further confused the story of the Spanish flu. Although it seems unthinkable today, publishing or speaking negative news in the U.S. earned violators a 20-year prison sentence, under the Sedition Act of 1918. Even the pandemic’s misleading nickname is owed to censorship. “The flu didn’t start in Spain and wasn’t any worse in Spain,” explains Bruce Olson, who gives local presentations about the Spanish flu. “But Spain wasn’t part of the war in 1918 – it was a neutral country – so its press freely reported the horror of the pandemic.” Spanish King Alphonso XIII was sickened by the flu, but so were other world leaders who concealed it from the press. Some scholars, including Dyer, believe U.S. President Woodrow Wilson was secretly weakened by the flu while negotiating the Treaty of Versailles. They say it’s why he didn’t hold his ground against French Prime Minister Georges Clemenceau, whose demands for overly harsh treatment of Germany set the stage for World War II just 21 years later. It’s ironic that, just as the Great War set into motion every U.S. war since 1918, the H1N1-A Spanish flu set into motion every flu pandemic since 1918. See related story, “Could It Happen Again?” (at bottom). So where did this freakish flu strain originate, if not Spain? That remains a mystery, as do several of its anomalies. Why did it hit hardest in fall, not winter like most flu? Why did it hit healthy young adults age 20 to 40 the hardest, in a W-curve rather than the usual U-curve that mostly kills the very young and old? And why did it kill so quickly, sometimes within hours of first symptoms? One points to pig farms in Belgium. Another to Kansas. Science writer John M. Barry, author of “The Great Influenza,” believes a blend of human and bird viruses infected the same pig cell in a pig raised in Haskell County, Kan. It moved with men to Fort Funston, in central Kansas, a training camp similar to Camp Grant. The first odd flu case was documented there March 4, 1918. “Within two weeks, 1,100 soldiers were admitted to the hospital, with thousands more sick in barracks,” Barry writes. He thinks they carried the flu to other U.S. camps and to Europe, from which it spread in every direction, evolving along the way. That spring 1918 wave of Spanish flu was the first of three waves and was relatively mild, although it killed people, as nearly all flu outbreaks before and since have done. (The 2017 flu season killed 80,000 Americans, up from the average 41,000. The U.S. Centers for Disease Control (CDC) reports that 80 percent of the children who died were not vaccinated). Antibiotics for fighting bacterial infections didn’t come into use until the 1940s; patients were treated with aspirin and quinine. People often spread flu before they knew they were sick. Symptoms hit suddenly, including high fever, head/body aches and a severe cough that produced blood-streaked pus. Blood might ooze from a patient’s nose, mouth, eyes or ears. A lack of oxygen caused cyanosis – a bluish darkening of the skin – and high fever caused delirium. This second, deadliest wave of Spanish flu arrived on the U.S. Atlantic seaboard in late August and raced westward. A third, milder wave returned in spring 1919. This little girl became so worried about her sick sister that she telephoned the Red Cross Home Service, who came to her aid, in November 1918. This scene played out across the world. Rockford was a prosperous city even before World War I weapon production caused wages to triple in 1917. But it really “hit the jackpot” when construction began on Camp Grant that year. “It was the single largest construction project Rockford has seen before or since [in terms of scope and size], employing 8,600 workmen,” says Dyer. “People today don’t comprehend how enormous Camp Grant was. It sprawled across 6,000 acres.” To visualize this, picture 4,600 football fields with end zones. The camp was built for 48,000 people and at one point housed 57,000. Rockford’s population was about 60,000. “So you basically had two self-contained cities within 5 miles of each other, sharing a lot of social interaction,” says Dyer. Early in 1918, the camp housed about 30,000 men, mostly from the Midwest, plus hundreds of nurses in training. It was deemed exemplary in its health standards after a June inspection. But by September, the camp population had swelled to more than 40,000. A new camp commander arrived in September, Col. Charles B. Hagadorn, age 51, a West Point graduate who had fought with distinction and was “married” to the military. Perhaps because the previous winter had been notoriously cold, Hagadorn worried about the men housed in tents. It was a decision he would deeply regret. Men from tents crowded into already-full barracks even though Hagadorn knew flu was sweeping through other camps. The very next day after issuing that Sept. 20 order, flu patients began trickling into the camp hospital. By midnight, 108 men were sick. Within two days, 400 soldiers were in the infirmary. Within a week, that number grew to 4,000 and the following week peaked at 10,713. The camp hospital was wholly unprepared for sickness on this scale. There were shortages of everything – aspirin, sheets, thermometers, cots. Mules grew too exhausted to haul ambulance carts of sick men to the 61 makeshift infirmaries made by relocating healthy men to tents. Sick men spilled onto barracks verandas, which workmen scrambled to cover with roofing paper before a major autumn storm let loose. Nearly 400 nurses couldn’t keep up with the filth-soaked beds of patients who were often delirious with fever. The camp attracted thousands of flies. The same scene played out in training bases nationwide as some 30,000 trainees fell ill. On Oct. 25, the State of Illinois announced that 1 million residents had become sick in the past month. All war training stopped. Healthy men unloaded supplies from trains, prepared food and hauled corpses. Barry reports that 250 Camp Grant men did nothing but stuff sacks with straw to make a steady supply of new mattresses. Adding to the confusion was a growing stream of out-of-town visitors, some of whom tried to bribe hospital workers into providing extra care to their sick loved ones. This forced Chief Medical Officer Lt. Col. H.C. Michie to issue a stern warning against accepting bribes. The Red Cross constructed a tent waiting room area on the base for these distraught visitors, but out-of-towners had no place to sleep since Rockford hotels were full. Many found warm beds and hot meals in the homes of generous local families. Residents of Winnebago County were especially hard hit by this flu because of contact with Camp Grant. By the end of the first week of outbreak in Rockford, City Health Inspector W.H. Cunningham, M.D., reported that as many as 2,000 Rockford residents were sick. This number is likely under-reported, since many rode out their illness at home. Local historians note it was the only time in Rockford history when churches were empty on Sunday mornings. Even funerals were prohibited. In some U.S. cities, volunteerism during the flu crisis was suppressed by rabid fear and distrust fueled by propaganda. For example, as Camp Grant death tolls climbed, the Chicago Tribune inexplicably printed “Epidemic Broken!” The government propaganda was meant to raise public morale, but often had the opposite effect. This wasn’t entirely true in Rockford, however, where hundreds of volunteers of all ages, male and female, answered cries for help. 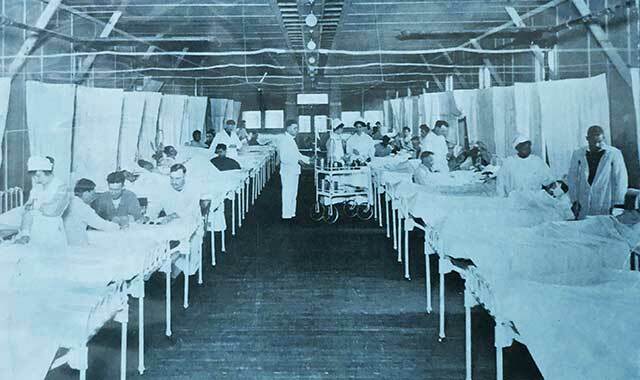 Civilian doctors, nurses and many others risked their lives in service to the sick at Camp Grant. “They were absolute heroes,” says Olson. A memorial arch dedicated to these heroic volunteers was erected at the camp in 1918 but was since destroyed. Rockford families hosted visitors; students stayed after school and grandmothers burned midnight oil to sew thousands of gauze masks and gowns; and many civic organizations put their talent and good will to full use. 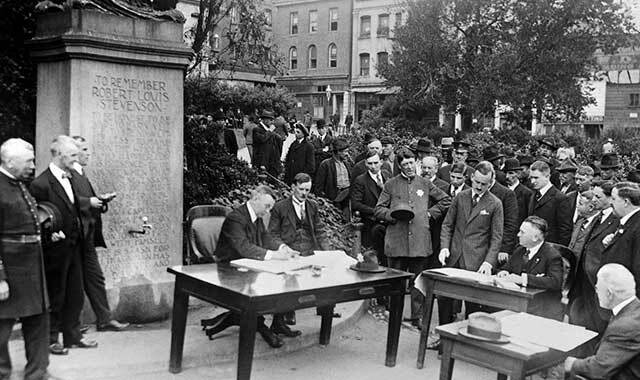 Among them were the YMCA, the American Library Association, Knights of Columbus, the Jewish Welfare Board, Salvation Army, churches and various war service organizations. Red Cross staff worked tirelessly. “At the War Camp Community Services (WCCS) headquarters, 111 S. Main St., visitors found automobiles operated by young women of the Red Cross motor corps ready to take them to Camp Grant. More than 1,000 people provided hospitality in their Rockford homes through the WCCS,” says Dyer. Rockford hospitals overflowed; the third and newest, SwedishAmerican, had opened two months earlier, with 55 beds. Along with volunteers, many Rockford buildings were put into service. The Knights of Columbus, Boys Club and Lincoln School buildings, as well Rockford Women’s Club, 323 Park Ave., were used as infirmaries. Women’s Club members had worked 22 years to fund and construct their shiny new Neoclassical building but generously welcomed the sick as first guests. Soldiers in training died at the rate of 75 to 100 per day, overwhelming the camp’s contracted undertakers, Murphy and Fitzgerald. “Five other undertaking firms were appealed to, but there still wasn’t room in their morgues for all the bodies delivered from camp,” says Dyer. Rockford businessman I.L. Bell, owner of the Overland Co. at 202-212 N. Church St., stepped up by allowing the company garage to be used as a Camp Grant morgue. The Western Undertaking Co. of Chicago sent several undertakers and five more came from Aurora, Ill. But it still wasn’t enough. When Camp Grant Commander Col. Hagadorn summoned additional civilian undertakers to the camp, Bruce Olson’s paternal grandfather, Fred C. Olson Sr., was among them. “My grandfather said that when he made that first visit to Camp Grant on Oct. 7, Col. Hagadorn was among the most distraught people he’d ever met. That’s really saying something. As funeral directors, we see a lot of distraught people,” says Olson. Camp medical staff members told Olson Sr. they wanted to show him something terrible. In an odd coincidence, Bruce Olson’s maternal grandfather also worked to embalm the dead of Camp Grant and Rockford. He was training at Camp Grant to be a medic when the pandemic struck. “They thought medics-in-training knew more about the human body than most people, so they had undertakers teach them how to disinfect, embalm and prepare corpses to be sent by train back to their families,” explains Olson. The dead weren’t just coming from Camp Grant, either. Sometimes parents died, leaving small children behind. Many pregnant women died, including Olson’s paternal grandmother. 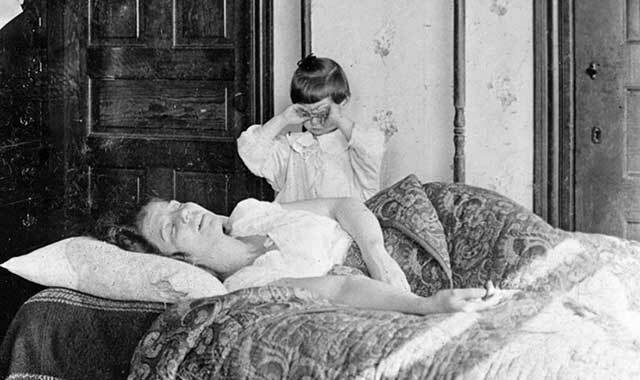 High fevers caused by the 1918 flu sometimes caused permanent damage. “My grandfather’s sister was brain damaged from the fever and killed herself by jumping into the Rock River,” says Olson. Olson’s grandfather was correct to assess Col. Hagadorn as an extremely distraught man on that Oct. 7 day in 1918. Early the next morning, after receiving the latest casualty list, Hagadorn ordered his sergeant to take everyone out of the headquarters building to stand at attention for inspection. The sergeant thought it odd, but complied. Thirty minutes later the sergeant heard Col. Hagadorn’s Colt .44 pistol fire. The commander had taken his own life. Within days of this event, flu casualties at Camp Grant declined. By the third week of October, they numbered only a few per day, although 800 sick men remained in the infirmary. On Oct. 30, the ban on public gatherings was lifted. Camp Grant soldiers attended Rockford theaters and dance halls again for the first time in six miserable weeks. And less than two weeks later, millions of people worldwide poured into streets to celebrate the signing of the Armistice at the 11th hour of the 11th day of the 11th month of 1918. Today we call it Veterans’ Day. While 20th century historians credit military heroes with winning The Great War, more recent scholars suggest the virus played a far bigger role than has been acknowledged. The 1918 flu brought every army to its knees, but it struck German soldiers at an especially critical moment, says Olson. Nearly everyone who survived the dreadful 1918 influenza is dead. But even when they lived, they often were reluctant to talk about this terrible nightmare, conflating it with the war they desperately wanted to put behind them. Olson began researching this pandemic about nine years ago because of its role in his family history. “I think of the children who were never born into my family because the flu took out my grandmother,” he says. “How many, many families are there like mine? The influenza of 1918 killed 5 percent of the global population, yet most of us dismiss flu as a nuisance, not a threat. Many people in 1918 also failed to take it seriously, confusing it with the common cold or a stomach virus, just as we do today. The flu can’t be fought with antibiotics because it’s viral, not bacterial. But there are anti-viral medications that can be effective if taken within the first two days. Although doctors insist the best flu defense is vaccination, only 37 percent of adults over age 18 got flu shots last winter, down more than 6 percent from the previous year. Last year’s flu season turned out to be especially severe, with nearly double the average annual U.S. deaths of 41,000. One reason people don’t get vaccinated is the mistaken idea that a shot will give them the flu. People also question whether it will do any good. To be sure, the constantly evolving nature of influenza virus makes it a tricky beast for health officials to manage. Unlike chicken pox or measles, there’s no “one and done” flu vaccine for life. Flu season lasts about two months, usually starting in January. Vaccinations ideally should be completed in October because they take a few weeks to fully kick in, but getting them in December is still beneficial. Children under age 8 need two doses, ideally in early October and four weeks later. There’s always ample vaccine. Rifkin explains that the most common way to produce flu vaccine is to inject selected viruses into fertilized hen’s eggs. After several days of incubation, the liquid is harvested and the live virus is killed. “This involves a LOT of eggs and it’s not speedy,” says Rifkin. There are four main types of flu virus, named A, B, C and D. Human A and B flus cause the seasonal epidemics. Type C causes mild respiratory illness and D mostly impacts cattle. The A and B viruses are divided into subtypes based on surface proteins H (18 types) and N (11 types). The 1918 flu was H1N1-A. The recent bird flu in China is H7N9-A and so forth. “Antigens” are molecules in virus surface proteins that trigger our immune systems to fight back by making antibodies. “Drift” refers to gradual changes in flu virus genes that happen as the virus replicates. Over time, these collectively add up to something our bodies no longer recognize. That’s why flu vaccine is constantly updated. “All influenza A pandemics since 1918 have been caused by descendants of the 1918 virus,” report flu researchers Jeffrey K. Taubenberger and David M. Morens, who helped to unlock the Spanish flu gene sequence in 2005. They used 1918 virus samples recovered from a frozen Spanish flu victim in Alaska and the preserved tissue samples taken by doctors treating soldiers in 1918. So, could a flu virus as virulent as the Spanish flu happen again? Because people now travel across the globe in a matter of hours, it will spread very fast. Vaccines won’t be developed rapidly enough to stop it. That’s the bad news. This entry was posted on Tuesday, January 29th, 2019 at 11:57 am	and is filed under Features, Top Posts. You can follow any responses to this entry through the RSS 2.0 feed. Both comments and pings are currently closed.